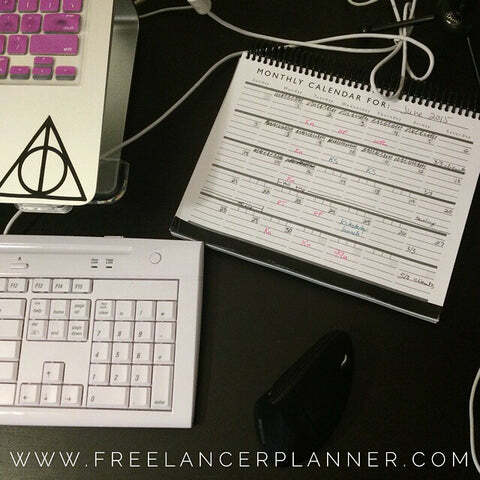 In today’s post: PR, press, & reviews – how I got them for the planner Kickstarter, and what effect they had. I wanted to get in touch because I’m working on a project I thought you might find interesting, since you write about freelancing tips and tools on a regular basis. As you might know, 34% of the US workforce is freelancing now (http://bit.ly/1R5pvwT), and that number is only going up – but there’s a problem. Those freelancers are often fantastic at what they do, but they have some very common struggles: staying organized, making their business a priority, and planning well. My fix for these problems, the Freelancer Planner, is currently funding on Kickstarter: http://kck.st/1LxcDfm It’s the first planner specifically designed to make freelancers more efficient and profitable. As we move more and more towards a flexible gig-economy that relies on freelancers, it’s absolutely crucial that freelancers learn how to be good business owners as well as talented designers (or writers, and so on). It’s my hope that the Freelancer Planner can help with that. Thanks so much for your time, and have a fantastic day! I sent a modified version of the above pitch in via their contact form. They didn’t email me for any more info. Instead, I got an email when the post went live – because my pitch had all the information needed to put together a post. I reached out to people who had told me to follow up when I was funded as soon as we met the goal, but six or seven days isn’t a lot of time for a news story turnaround on short notice – especially when that time stretches over a weekend (the 22nd was a Wednesday, the 28th was a Tuesday). So next time I do anything like this, the goal will be to get funded with a solid two weeks left (or more! ), giving ample time for people to cover the campaign after it’s funded. Another route that I went, instead of just pitching people on writing about the campaign, was sending review copies to people who covered related topics. Not unsolicited, mind – I’d reach out via Twitter first and ask if they were interested in writing a review or just wanted to see it, and if they said yes, then I’d send it. Some of these people I was already engaging with; some I found via posting in Facebook groups or searching for people who tweeted about freelancing (or topics that freelancers often tweet about, like design or writing). I also openly posted on Facebook & Twitter that I’d send a review copy to anyone who wanted to write about it. Something I wanted to try with this Kickstarter was getting on Product Hunt. In case you haven’t heard of it, Product Hunt is like an aggregator of new/cool products and apps, with a massive audience (their In other words, getting on the front page of Product Hunt is a really big deal. Basically, unless you’re in a select group of users, nothing you post goes on the front page. Instead, it goes on an upcoming page, that most people don’t check. Moderators can bump something from the upcoming page to the main page, but my understanding is that that doesn’t happen very often. At any rate, I found myself with a Product Hunt invite/postable account. I asked a friend if she knew anyone who could post it, so she introduced me to someone who did, who didn’t post it, but instead invited me…it’s like the dang mafia up in here. I posted it (and ran its own little mini-promotion campaign, with tweets linking to Product Hunt and prompts to backers to upvote it – read more on launching/promoting on Product Hunt here), but it stayed on the upcoming page for a day or two. Despite that, it still drove backers and traffic (see below). Now, like I mentioned before, depending on the link shortener used, shortened links can count as direct referral traffic…or links (shortened or not) that were opened in a new browser tab. (More on direct traffic here & here.) Looking at the referrals in the bit.ly dash, 19% of the clicks came from the CreativeBloq article (so it probably created more backers than the report shows). All told, the press/PR/review efforts drove a decent amount of backers. There’s a few things I’d have done differently, but I’ll be covering those in a post at the end of the series.